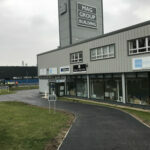 We were called in to complete a car park resurfacing for a local company – MAG Group in Norwich. Their current car park was worn out and had issues with several pot holes. 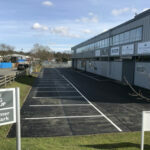 Once completed the car park was pot hole free and had a smooth finish. 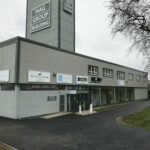 To start the job we replaced all of the car park edgings, with new concrete edgings. All of the gullies and man hole cover lids were raised ready to be in line with the new surface. We thoroughly swept the car park using a mechanical road sweeper. This gave a clean surface to start laying the new tar mac. 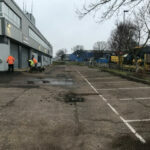 We then regulated the car park area, filling in: pot holes and worn out areas. Next we applied a K140 emulsion tack coat to the old surface area. This was sprayed over the whole car park area and will allow the new surface to bond with the old. 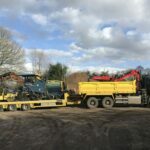 Hot 10mm SMA tarmac was delivered from our local supplier. We hand laid this in several areas, as our machine was unable to reach these points. For the rest of the car park, we used the Ammann machine pavior to lay the larger areas of the car park. Once all of the tarmac had been laid, we then rolled over and compacted to give a firm base and smooth finish. 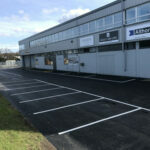 The following day after the tarmac had set, we then marked out all of the parking bays. 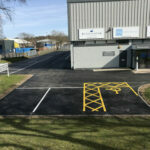 Then we went over the markings with a thermomastic line paint to complete the parking bays. 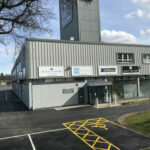 White was used for the majority of parking spaces and yellow was used to mark the disabled parking bays. All of the works were carried out over a weekend, this was done to ensure that there was no disruption to Mag’s trading during the week. 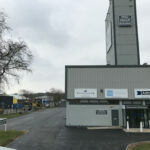 If you would like to know more about our surfacing services; then please make an enquiry through our email: [email protected] or give us a call on: 01508 470674.